Anyone is welcome to join, it will be same as any other time you join Minisiege - no password! It is 1796 and Napoleon Bonaparte has been appointed commander in chief of the French army in Northern Italy, this comes after the resignation of general Schérer. 2 years prior in 1794 the Austrian led allied forces attempted an attack on southern France, but failed due to the tactical genius of, the then artillery commander, Napoleon. 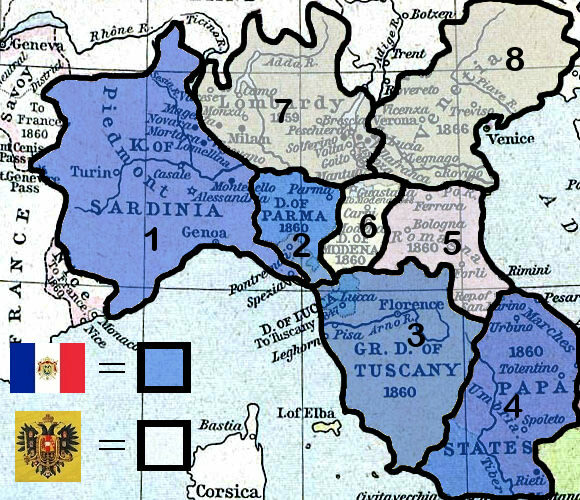 2 Factions will fight over the territory of Northern Italy (To mimic the Italian campaigns of the 1st coalition), each starting with 4 "provinces". If, for example, France were to decide to attack area 6 of the picture provided and win, this territory will then become a part of France. After this victory France can decide to continue the attack or defend. If a side loses all of, or most of, it's territory then the campaign will end and the other side will be the victor. There will be 1 round per map, the second round will be used as a voting time for the team who won the first round to attack / defend. This also gives us time to update the actual campaign map. Event will last roughly 2 hours a day until the victor has been decided. Depending on the day, the event could be paused with a whole day inbetween before restarting where we left off. Factions will only be able to attack territory adjacent to their own (Strawpolls will ensure this). Discord voice chat will be used to provide better communication between teams if you want to join in feel free then! Strawpolls will be posted on our Steam Group and Discord so you can get involved then! Everything in this event is optional and nothing will be forced on people - no team forcing, no lining up enforcement, ramboing is allowed as always and first come first serve to artillery as always. If you have any questions feel free to ask them here or on our Discord. Everything will be available on our Discord, regular announcements and updates will be provided there too. The first event outlined above was a success! Austria absolutely decimated the French, as of which France didn't win a single battle... From experience gained from this event, we've decided to open the event up for both servers - Eu_Commander and Minisiege. All of the event can be found outlined below! The will begin on Friday the 27th of July at 5pm UK time! After our very close vote to choose where you'd like the next "Mini Campaign" to be, it was concluded that South Germany would be our next destination! The time setting that I have chosen for this event will be 1805, the War of the Third Coalition. Outline for our campaign is below. This time around, we will be using both Minisiege & Eu_Commander for the campaign. All historical linebattles will be fought on EU_Commander. E.g. Austerlitz. These battles will add no real impact to our campaign map, as of course there is still garrisons within the forts of the regions. If the army gets beaten in a battle, the remaining forces will run for the garrisons. If, however, a faction loses 2 battles on EU_Commander in a row and that faction is winning in sieges and attacking, they will default to having to defend as their offensive capability will be gone for a short period of time. For example, if France was winning sieges on Minisiege & voting to attack after another Victory - if they happen to lose 2 battles on EU_Commander - they will be forced to defend and Austria will then vote to attack France. It is 1805, Napoleon has already beaten the 1st & 2nd coalitions, although no gains have been given to France, especially after the horrible defeat suffered in Northern Italy in 1796. In an attempt to deal a crushing blow on the British, Napoleon has gathered his newly found Grande Armée in Northern France in Boulogne with the plans to strike at the very heartland of the British isles. However, with the recent threat of the Austrian & Russian armies, Napoleon set his eyes upon the Rhine and to finally pacify the Holy Roman Emperor in Austria once and for all. 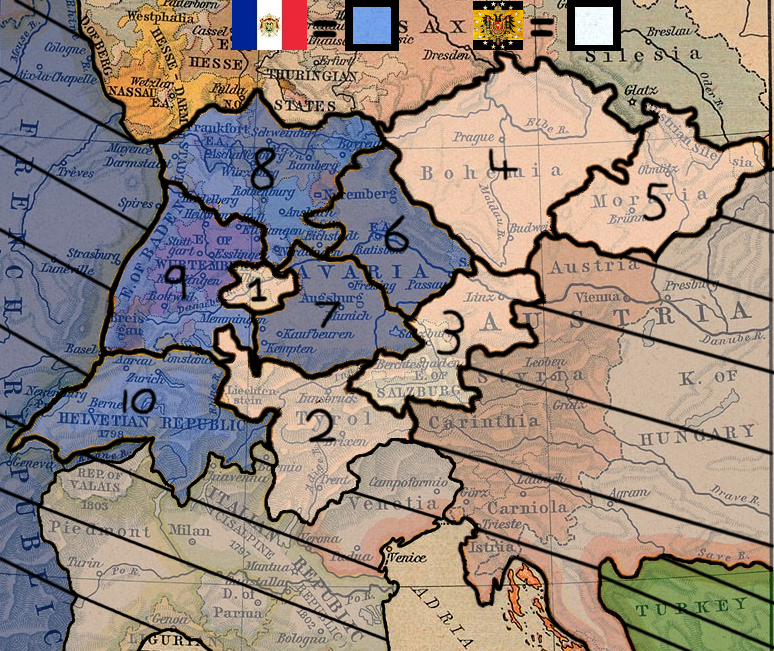 Multiple factions (Mainly France & Austria) will fight sieges & battles to gain territory on the campaign map shown below. For example, if France were to attack region "1" and win the battle, this will turn to French control. If a faction wins, they get to vote where to attack next, if they lose the enemy team gets to vote where to attack. Discord voice chat will be used to provide better communication between teams on both servers(optional usage, ofc) if you want to join in feel free then! Strawpolls will be posted on our Steam Group and Discord so you can get involved then! - No team forcing - This means you won't be locked into a team, you can choose whichever side you want whenever. - First come first serve to artillery as always. 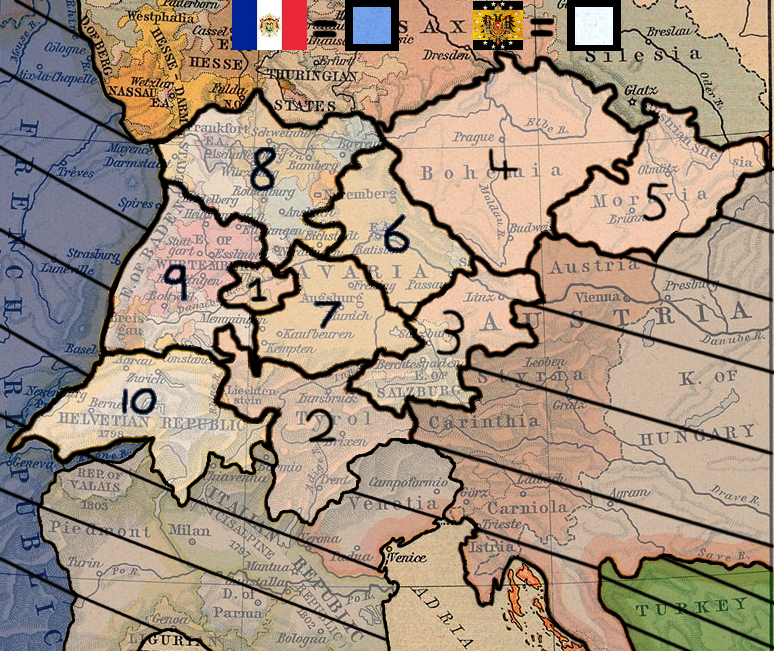 The above campaign ended with France being utterly destroyed again, leading to Napoleon committing suicide for the third time in this Mini-Campaign. The events will continue again around Christmas, as everyone will be busy now with work and returning to school. Thanks to all of those who came to the events when they were being hosted! Pic of final outcome below, full Story of the events battles, in order and with a story for each battle on both EU_Commander and Minisiege, can be found on our Discord in it's own channel category named "Event battles". On another note, we've updated the server once again with some map changes, changes indicated below. Credit to Aztir and Loifas for their changes to map 1 & 15, and to Zebaad for the church map. Map 7 & 9 were edited by myself, so #BlameGretel4BadMaps. Flattened terrain inside fort so it isn't as wonky. Changed bunker to be more appealing and more defenceable. Added a secondary wall inside the fort. Removed attacking cannons, added a destroyed cannon where main one used to be. Moved molotovs around, removed attacker molotovs to prevent through floor kills. Widened Front balcony to make melee easier and navigation better. Removed circular tower outside main gate and added a cart and food stall in its place. Basement now has a floor. Added small ladder up to roof so you don't have to jump anymore. Moved 8 defender spawns into the attic. Added a new building for attackers and defenders to use near the main building. Remade boat so it's easier to navigate. Church map re-added into rotation, pictured below. Added scaffolding entrance at the back. Removed attacker mortar, moved defender arty. Discord link is on our website - http://www.nwpublic.com/ ; Just click the "Connect" button up the right or type this web URL http://www.nwpublic.com/discord if you care for that kinda thing. - We've made it so players have the ability to get the likes of Cups, Tea and bottles on our maps. This can be done if you hold F on props that have the "Use" option on them. Thanks to Caesim once again for his continued support of new scripts! - Along with our molotovs, we now have fragmentation grenades! These have no explosive damage but have a lot of shrapnel, great for killing grouped up enemies! - These spawn 50/50 (roughly) with Molotovs in crates. - They look just like a holy hand grenade. - Works just like a molotov, explodes on impact after throwing it. Thanks to Caesim for these again. There are now cosmetic rewards that you can earn on the Discord to show your great deeds on our servers! Find all of the information about these on our Discord. - If you wish to apply for one of these, use the #賂reward-and-expert-applications channel. Templates etc are in the info channel. - These rewards may in the future allow you access to some skins in-game! Will keep you posted on this at a later date. - #磊rewards-information Channel has been updated to have more detail and some extra information on what you need for each reward. - Some rewards contain Skin rewards (Minisiege only currently), but not every medal has a skin. There are 2 versions of a reward, the actual cosmetic reward on Discord and the Reward + Skin. - To gain the skin, you must show continuously to us that you are doing what the reward is about, and that you are really good at it! - Added new welcome messages for bot to announce when someone new joins. - New bot invited to server so you can see what server population is without visiting out website. - Dima got admin of the Month for September, congrats! - New maps added to rotation. Both servers were updated on day one with the patch hotfix. WW1 Event is being hosted on November 11th 2018 @ 5pm GMT to remember the 100 year anniversary of the wars end.